As in any racket sport the service should not be simply used as the the means to starting a rally, rather the service provide the chance to take charge of the point from the outset. I endorse the low backhand serve to start the point. 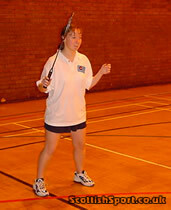 In particular, in the doubles game the correct execution of this serve is vital. Advantages - If the serve is good enough, it will force the receiver to lift the shuttle thereby allowing the server (or partner) to move into attack. Disadvantages - The only minus is if the serve is too high. My motto is good serving wins good games. 2. 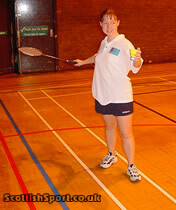 Turn the racket "upside down", the shuttle is held in the other hand, thumb and forefinger (see left). 3. Then prior to striking the shuttle over the net, relax posture and attempt to play shuttle low over the net and on to the front service line of the court. 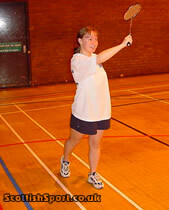 This service is often used in the singles game... and rarely in the doubles game. Advantages - This service will move the opponent to the rear of the court and will therefore create a lot of "free" on court. Disadvantages - The high serve will provide the opponent with time to attack with a smash or a drop. This disadvantage is even more evident in doubles where the opponent is offered the attacking opportunity from the outset of the point. 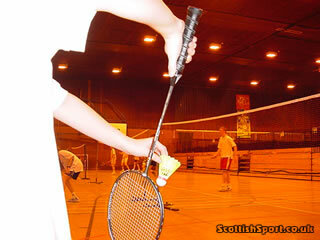 David Johnston is a Qualified Coach & coaches at Cumbernauld Junior Club.